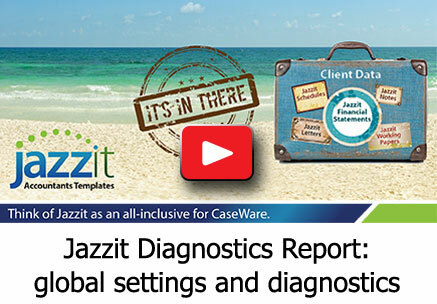 The diagnostic report (JZDIAG) is included as part of Jazzit Fundamentals. JZDIAG displays all outstanding working paper diagnostics and available updates for all Jazzit working papers and letters. This article will highlight several new features added to the JZDIAG. The Jazzit financial statements (FS), letters and working papers feature a draft stamp that can be switched on or off. By default the draft stamp settings for all working papers and letters will mirror the draft stamp setting of the FS. This FS draft stamp setting can be overridden within the individual working papers and letters. The graphic to the right shows the draft setting for the Property, Plant, & Equipment working paper. The ‘FS set to On’ indicates that the FS draft setting is currently set to On. 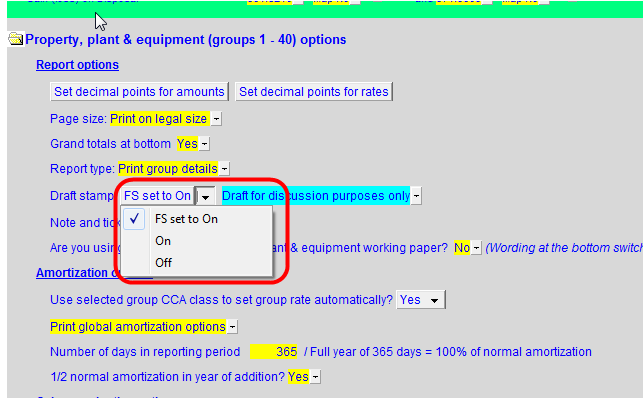 The FS draft setting can be overridden with the ‘On’ or ‘Off’ options. A draft stamp switch is now included in the JZDIAG. When activated, the draft stamp setting in the JZDIAG will be applied to all working papers and letters, overriding the FS setting. The draft settings for the FS can be kept separate from the global draft settings. Draft settings can still be specified for individual documents when using this feature. Many working papers can include references for line items (W/P references). The preparer can set whether or not the working paper keeps these references when the CaseWare file is rolled-forward (Engagement > Year End Close). Originally the preparer had to set this option individually for each working paper in the CaseWare file. A switch has been added to the JZDIAG that will set the W/P reference option globally, eliminating the need to set them individually. When the JZDIAG W/P reference option is activated, the preparer will be unable to set the W/P reference option in the individual working papers. 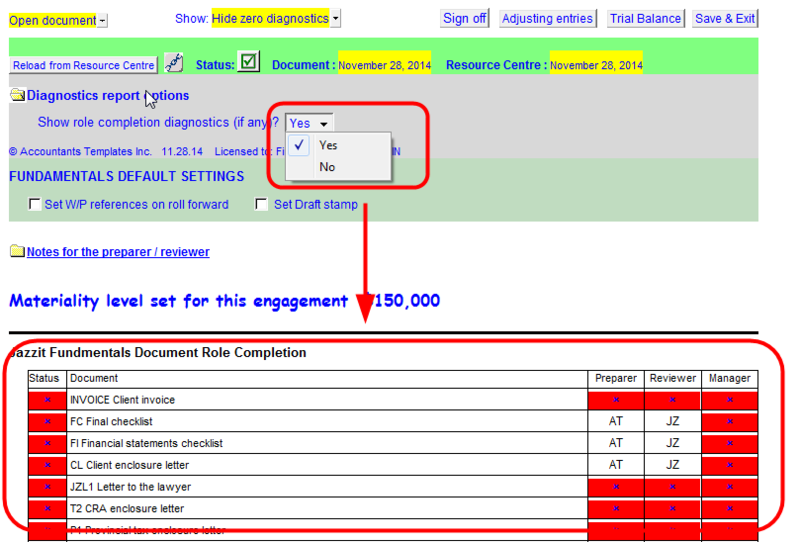 The role completion diagnostic provides a centralized location to check the role completion status of all Jazzit working papers and letters in the file. This diagnostic is enabled and displayed in the JZDIAG. The JZDIAG is useful for determining if all Jazzit working papers and letters are up to date. Originally this function did not apply to the additional working papers (W1-WK), additional letters (Q1 – QK), and customized copies of existing Jazzit templates. Those documents can now be added to the JZDIAG through the resource centre (klib). To add a new Jazzit document, open the resource centre (klib) version of the JZDIAG. There will be an area entitled “Additional documents in Document manager”. Right-click on the express button (button with a mouse graphic) located there. Click on the “Insert a document” option. Select the document from the dropdown menu. Once reloaded, the JZDIAG will now indicate when an update is available for the document selected.